This page describes what actually happened compared to my planned itinerary, since life–and therefore, changes–happen! I landed in Hanoi on schedule, and breezed through customs and immigration. My driver was waiting to take me to my hotel in the Old Quarter. The hotel I booked was flooded because of the recent typhoon and monsoons, so I stayed just around the corner in a charming sister hotel that I fell in love with. My two morning sightseeing tours went off without a hitch, and I saw a good deal of Hanoi, as I expected to. I didn’t get to see the water puppet show, a tradition that dates back to the 11th century, because of a really rude Australian millennial backpacker. It will just have to be on my list for the next time I visit! The evening street food tour went as planned, and I stuffed myself with delicious food and spent the evening with a lovely young Vietnamese woman. Unfortunately, because of the monsoon and massive storms, my Halong Bay adventure aboard a traditional junk boat was canceled. I had a really responsible tour company that told me up front the day before that it would be a no-go, and they rescheduled me on a tour to the “inland Halong Bay” near Tam Coc, where they had recently finished filming scenes for Kong: Skull Island, and Ninh Binh. It wasn’t what I had planned, but it was a beautiful area and a lovely day with a great guide and two other American women who would have been on my junk boat with me. That left me an extra day in Hanoi. The massive storms that had canceled my trip raged through Hanoi on my last night, but when I woke up on that third day, the skies were cloudy, but it wasn’t raining, so I headed out to visit the infamous Hanoi Hilton, something that I did not think I was going to get to see because of the limited time in Hanoi I had on my original itinerary. I also had a chance to explore the Old Quarter in greater depth before the monsoons started again in the afternoon. I caught the Reunification Express overnight train to Hue as planned and explored the Citadel and Imperial City, the Royal Tombs of several emperors, and the Thien Mu Pagoda. I did get my dragon boat ride down the Perfume River, too, before a harrowing visit to Dong Ba Market. Instead of hopping aboard the Reunification Express to travel to Danang, I went on the back of a motor bike! As a result, I got to make stops along the way and visit Elephant Springs, Lang Co Beach, and the peak of Hai Van Pass. All three were amazing, and I am so glad that I didn’t miss them by taking the train! My driver took me all the way to Hoi An (the train would have let me off in Danang). I did indeed get a bespoke dress made for me by one of Hoi An’s famous tailors, and I succumbed to the lure of elephant pants. As planned, I explored Ancient Town, took a boat ride to a nearby island for a (yummy!) cooking class, and experienced a boat/bicycle/sunset BBQ tour. I fell in love with Hoi An and don’t feel like I saw enough, so I can’t wait to head back there and really explore Ancient Town. After Hoi An, it was to Danang for a day. I spent the morning at the famous beach known as China Beach in America and My Khe Beach in Vietnam. I had planned to see the Danang Cao Dai Temple, the Danang Cathedral, and a museum devoted to Cham sculpture, but the timing and logistics just didn’t work out. Next trip! I am also hoping to see the largest Cao Dai temple, the Holy See, in southern Vietnam on my next trip. On my birthday evening, I boarded another overnight Reunification Express train to Saigon. This part of my trip went as planned, and I explored the markets on a cyclo, visited the Reunification Palace and (former) Cercle Sportif and many other famous Saigon landmarks, indulged in another evening street food tour, and had high tea (yes, with Veuve Clicquot, TYVM!) at the famous and historic Caravelle Hotel. I made it to all of the Saigon rooftop bars on my list, and one I didn’t have on my list. The Cu Chi tunnels were definitely a highlight of my trip, but I didn’t pay the few dong extra to shoot a fully automatic AK-47. As I mentioned on my planned itinerary page, I had 15 days In Country, but was actually gone for 18 days. It was the longest trip of my life, and I knew I wasn’t going to see nearly enough of the country, and I was right, especially since I didn’t get to Halong Bay or the holy sites in Danang, as I had planned. I have another 2-week itinerary planned that I developed in early 2018, and this one still doesn’t include the northern highlands (and Sapa), central highlands (and Dalat), My Son Sanctuary, or Son My Memorial. 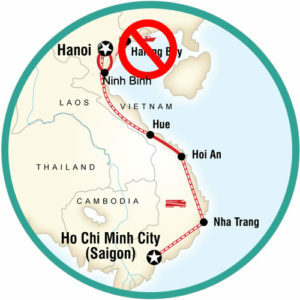 The itinerary does, however, include the Mekong Delta and Phu Quoc Island. I have a feeling I am going to need to visit for the rest of my life to truly satisfy this particular wanderlust.